Four St. Francis students and four of our key student volunteers in the garden decided to continue to give back to the Growing Together, a giving garden for the Arrupe Project at their school. Named after Father Pedro Arrupe S.J. who said, “Our prime educational objective must be to form men and women for others,” the goal of the project is to empower students to become men and woman for others through faith, service and justice as they seek out worthy charities to support through their project. The students are required to earn $10 which is then matched by St. Francis Xavier School and the $20 is then used to purchase necessary supplies to plan, organize and facilitate a fundraiser for their chosen charity. Clare Cronin served ice cream sundaes in the garden, Katie Hobaica hosted A Spa Day for kids, Katie Moore held an ice cream social in her neighborhood, and Bella Rose ran a volleyball clinic for younger kids. 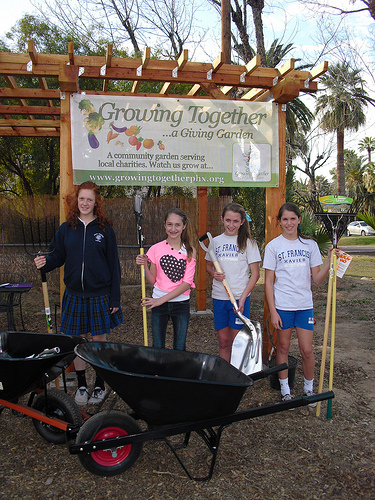 Each girl with their individual fundraising endeavor collectively raised over $900 for the garden. Together they went shopping and purchased essential garden tools like wheel barrows, shovels, rakes and pitch forks. Why did they choose the garden we asked . . . and they shared, “The garden involves the community and I like helping on Saturdays with my friends . . . I love the purpose of what the garden brings to those who don’t get to eat fresh vegetables like me, and I enjoy gardening . . . I come here often and learn things I never knew like lasagna composting and what grows in the winter vs. summer . . . my Mom is involved with the garden and I really like being involved with helping the community.” What do you hope to see come of your donation of tools and supplies . . . and they said, “We hope to see more involvement by volunteers using the tools to cultivate and grow more food to give to others . . . I hope the tools and supplies make it easier for us to help the garden grow . . . In one year, I hope we have food growing everywhere in the garden, more seeds, more growing, more community, more food and more service to others . . .” and the generosity of their hearts just keeps on giving . . . Thank you, girls! You are a gift to the garden! Anyone notice our recent additon over the weekend?? We actually have the fence posts installed for the fence we have wanted for over a year! We were contacted recently by a local publishing company, McMurry (you may have seen their offices on 10th St. & Missouri) asking if their company could do anyting for us at the garden. Because a fence has been at the top of our list for a long time, we boldly said we needed a fence followed by a disclairmer saying that we wouldn’t expect them to take that on but that we had several other things we would be delighted to have their help with. They took the challange and made our fence a reality! We can’t thank them enough! What a great group of people! P.S. They also planted, weeded and did lots of other things that really helped us out! Thank you girls!!! The tools you have provided us through the Arrupe Project are used each and every weekend to help keep us growing. We really appreciate your support and you for your generosity. Many thanks!